It all started last Thursday and after three Day 1 flight’s, a gruelling Day 2 and an exciting final table, Brendon Rubie has been crowned the champion of the 2012 Aussie Millions Opening Event. This time yesterday, Rubie and dozens of players were set to be playing down to the winner. As the tournament went late into the evening, it was decided that the final table would be coming back today. Within the first hour, the two short stacks at the table had been eliminated, with Sean Robey going home in 10th place before Tamara Volkoff joined him on the rail in 9th place. Naz Sibaei was the next player to be eliminated, with his demise occurring a couple of hands after he lost a massive pot to the eventual champion. After Sibaei was sent home in 8th place, Sherif Derias was eliminated in 7th place. Next to go was local Manny Stavropoulos in 6th place, with his elimination coming just a few hands before Tam Troung joined the rail in 5th place. John Thomson was the short stack for much of the afternoon and put in a great effort to make it to 4th place. From there, Rubie began his rise to the top when he picked up a huge pot against Rob Angood who ran his into the of Rubie. Angood never recovered from there and Rubie would end up dealing the fatal blow that sent Angood home in 3rd place. The heads-up battle started with Rubie holding a 2-1 chip lead over Wilson and Rubie would hold on to that lead for much of heads-up. The game changing hand of their battle began when Rubie opened the pot for 125,000 and Wilson promptly three-bet to 250,000. When Rubie made the call, a flop was dealt. Wilson led for 350,000, Rubie called, and the hit the turn. Wilson opted to check this time and then called Rubie’s bet of 325,000. The on the river saw Wilson again check and this time Rubie simply slid out a huge stack of chips. When Wilson made the call, Rubie confidently turned over his and Wilson proceeded to look disappointed. Rubie knew he had taken down the hand and even went to the rail to celebrate the victory. Unfortunately for Rubie, Wilson was actually left with a few big blinds and Rubie apologized as he sat back down to continue the tournament. With only a few hundred thousand in chips, Wilson didn’t have too many options and proceeded to move all in. A couple of double-ups for Wilson and he had a pulse again as Rubie tried to recompose himself. The inevitable last hand of the evening occurred when Wilson got his stack all in on a flop. Rubie’s was enough to be well ahead of the of Wilson and when the turn and river bricked out, it was all over for Wilson as he was sent home in 2nd place for a hefty $125,000 score. 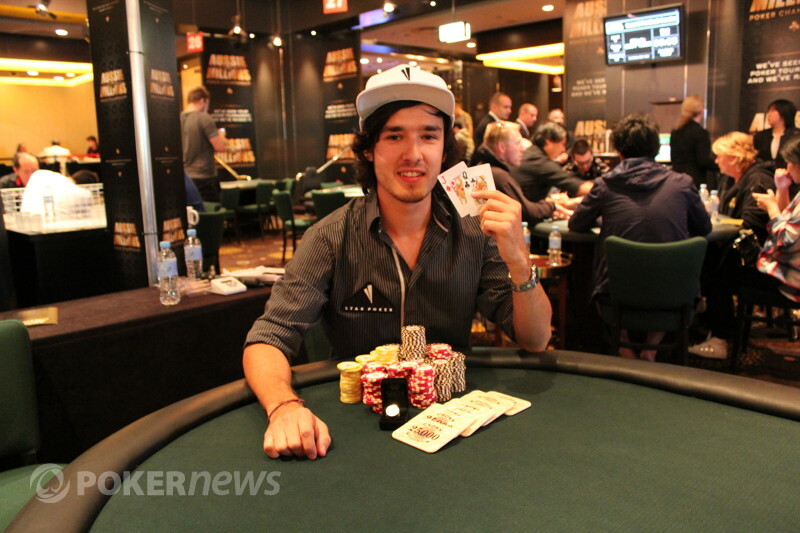 Not only did Rubie receive $200,000 for his victory, but can now add an Aussie Millions gold ring to his resume and will go down in history as the champion of the 2012 Aussie Millions Opening Event. Check out Rubie's winner interview with our very own Lynn Gilmartin. That’s all from the PokerNews Live Reporting Team! Make sure to return in a few days as we provide continued coverage of the 2012 Aussie Millions, with our team on the floor to catch all the action of Event 5: $1,100 No Limit Hold’em 6-Handed. In a raised pot, the two players saw a flop of and Brendon Rubie bet 150,000, which prompted Scott Wilson to move all in for a little less than 2 million. Rubie made a quick call and was in a good spot to take down the title. Wilson needed a three or four to keep his tournament hopes alive, but it was not meant to be as the appeared on the turn followed by the pm tje river. Wilson fought hard all day long, but in the end he finished as the runner up in the Opening Event of the 2012 Aussie Millions for $200,000 AUD. Stay tuned for our recap of all the action. After some jockeying back and forth and several small pots, Scott Wilson moved all in for 935,000 and received a call from Brendon Rubie. Rubie was ahead, but Wilson was drawing to live cards, one of which came on the flop. In order to eliminate his oppnent, Rubie needed to hit and ace, though that option disappeared when the turn gave Wilson two pair. The inconsequential was put out on the river as Wilson doubled to 1.9 million and back into contention. Just when it looked as if Rubie had things licked up, Scott Wilson has charged back with two doubles in a row. The first came when he put 305,000 all in preflop with and was up against the of Rubie. The flop gave Wilson the better pair, and the turn and river kept him there. Just like that, he was up over 600K. In the very next hand, Rubie moved all in from the button and Wilson called off from the big blind. Wilson was ahead and stayed there as the board ran out . In just two hands, Wilson went from the brink of elimination to having over a million in chips. Brendon Rubie opened preflop for 125,000 and Scott Wilson three-bet to 250,000. Rubie made the call and then watched as the flop came down . Wilson led out for 350,000, Rubie called, and the hit the turn. This time Wilson checked, Rubie bet 325,000, and Wilson called. When the hit the turn, Wilson checked, Rubie slid out a huge stack, what turned out to be 1.2 million, and Wilson called. Rubie confidently rolled over and seemed to know he was good. Indeed he was as Wilson tossed his cards to the muck. Rubie went over to the rail to celebrate, thinking he had won, but when the stacks were counted down, Wilson was left with 300,000. A chip and a chair, folks. Brendon Rubie took down the first couple of hands after the break. The last hand that Rubie won played out like this. Rubie opened from the button and Scott Wilson made the call. The flop saw Wilson check-call a bet of 125,000 from Rubie. The saw Wilson check-call yet again, this time when Rubie bet 275,000. When the landed on the river, Wilson again checked but this time he would fold when Rubie bet 300,000. Here are some more photos from Day 1 of the Opening Event for your viewing pleasure. 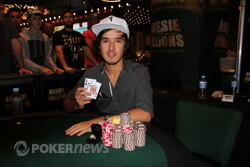 Brendon Rubie wins the $1,000 Opening Event of the 2012 Crown's Aussie Millions Poker Championship for $200,000.